Procures renewable sources of electricity and partners with a utility to distribute energy to local communities, You get all the advantages of cleaner, greener, healthier energy consumption AND all of the advantages of the established, experienced energy provider. In the past, one utility provided the all components of energy service: generation, transmission, distribution and retail. Legislatures and the public utility commissions (PUC) of many states have created competition for electricity and natural gas supply. This allows consumers to choose their energy supplier, while the delivery of the energy is still regulated and is the responsibility of the local utility company. Electricity Generation - The process of generating electric energy from other forms of energy. Electric power transmission or "high voltage electric transmission" is the bulk transfer of electrical energy, from generating power plants to substations located near population centers. Historically, transmission and distribution lines were owned by the same company, but over the last decade or so many countries have liberalized the electricity market in ways that have led to the separation of the electricity transmission business from the distribution business. 2002 the California Legislature passed AB 117, California Community Choice Aggregation adding Section 366.2, among others, to the Public Utilities Code. The law gives local governments the ability to combine electricity loads within their communities and act on behalf of those customers to buy or choose electricity for them. California State Bill 790 (SB790 - Leno) California Public Utilities Commission (CPUC) recently found that utility opposition to CCA has forced CCA efforts in some communities to be abandoned. The introduced California State Bill 790 (SB 790) ensures that CCA remains a viable option for local governments as intended by the original Assembly Bill 117 and by the voters who opposed Proposition 16 in 2010. CCA has been extremely difficult to implement for local governments, in large part due to the ability of incumbent utilities to actively block CCA start-up efforts. Existing law requires utilities to cooperate fully with communities seeking to establish a CCA. SB790 would clarify ambiguous language in the original Assembly Bill 117 to improve cooperation between local governments and investor owned utilities. Additionally, the introduced Assembly Bill SB790 would direct Public Purpose energy efficiency funds from PG&E to the CCA. Public Purpose funds account for 3 percent of the City-wide PG&E bills, which amounts to millions of dollars each year. These Public Purpose funds are currently distributed across the state and consumed partly by PG&E overhead costs and ineffective programs. Cities have very little input as to how Public Purpose funds are spent in their jurisdictions. The CCA would allow the City to develop more effective Public Purpose funded energy programs for the community and create more job opportunities for residents. renewable energy facility" and receive a bill credit for the generation component of the customer's electrical service. SB 843 establishes a new program to allow any IOU customer to pursue off-site renewable energy. Based on the successful model established between PG & E, the City of Davis and the PVUSA solar facility, this bill allows all participating customers to receive a credit on their electricity bills for the clean power they purchase at an off-site renewable energy facility. Allowing customers to opt into larger energy facilities and pool their resources will reduce the price they pay for clean energy, and access to this renewable energy will be increased. The author indicates that "?only a small percentage of California homes and businesses are appropriate sites for renewable energy. Many customers are interested in using solar energy, but the arrangement at their home or business is not a good match for installing solar. For example, some customer sites - both businesses and residences are overly shaded or not oriented in the proper direction; in many cases customers are renters who do not own the property at which they live. The bill allows for Californians to access an optimally located renewable energy facility, shared by multiple customers, rather than being limited to renewable energy options on their own property. manner, the program conflicts with federal law?SB 843 also raises the specter of unregulated entities participating in the retail energy market. Limits a community renewable energy facility to 20 megawatts (MW) capacity and requires the facility to be located in the service territory of an IOU with more than 100,000 customers and be an eligible renewable facility pursuant to the state's Renewable Portfolio Standard (RPS) program. Limits the statewide capacity of community renewable energy facilities to 2,000 MW, and requires the Public Utilities Commission (PUC), when statewide capacity reaches 1,500 MW to determine whether the 2,000 MW limit is necessary or can be raised or eliminated based on the commission's determination of the impacts on IOU ratepayers. Requires the PUC to reevaluate the added value methodology every three years in order to maintain the program goals, including indifference of ratepayers not benefiting from the program. Limits the interest of non-public entities participating in a community renewable generation facility to 2 MW of generating capacity. Stipulates that interconnection process and cost allocation for facilities under this program are to be determined under rules established by the PUC. California Assembly Bill 117 - The passage of AB 117 came in response to the 2000 energy crisis and the ensuing bankruptcy of Pacific Gas and Electric Company, which darkened much of the state and sucked billions of dollars from the economy into the coffers of Texas energy corporations. AB 117 was a strategic shift in a decades-old campaign to wrest economic power away from giant corporate utilities like PG&E and Southern California Edison and the big energy companies that supply them with electricity. AB 117 eliminated the need to own the energy grid and enabled Community Choice Aggregation, or CCA. a new model of energy provisioning. California Assembly Bill 976 (AB 976 - Hall) - Would prohibit a community choice aggregator (CCA) from procuring electricity or energy services from any entity that provided any analysis, advice, consultation or other services to the CCA prior to it providing the 30-day notice to the incumbent utility of commencement of service to customers. This bill would create a new barrier to the formation of any Community Choice Aggregation (CCA) programs. CCA - Community Choice Aggregation - Allows cities and counties to pool their citizens’ purchasing power to buy electricity. CRS - Cost Responsibility Surcharge - The CRS is a charge the utilities will assess on CCA customers in order to prevent the shifting of generation-related costs onto remaining utility customers that might result from transfer of electric service to a CCA. The CRS includes costs incurred by the California Department of Water Resources for contracts entered into during the 2000-2001 energy crisis as well as costs incurred by the utilities for generation and power purchase contracts. AB 117 directed the CPUC to establish the CRS before it authorizes implementation of CCA, and the CPUC designated this phase of the proceeding to determine the methodology and issues surrounding the calculation of the CRS. H Bond Authority - San Francisco ordinance (Charter Section 9.107.8, Ammiano), which combined the power purchasing authority of CCA with a revenue bond authority to finance the new green power infrastructure, worth approximately $1 Billion. IPP – Independent Power Producer – Produce and sell electricity on the wholesale market at market-based rates, and do not have franchised service territories. Most are designated as exempt wholesale generators, which relieves them of many of the regulatory requirements applicable to traditional utilities subject to FERC regulation. Allowed fair access to transmission system by FERC Orders 888 and 889). MASH - Multifamily Affordable Solar Housing - Solar PPAs are now being successfully utilized in the California Solar Initiative's MASH program. PPA - Power Purchase Agreement- A legal contract between an electricity generator (provider) and a power purchaser (host). The power purchaser purchases energy, and sometimes also capacity and/or ancillary services, from the electricity generator. One of the key benefits of the PPA is that by clearly defining the output of the generating assets (such as a solar electric system) and the credit of its associated revenue streams, a PPA can be used by the PPA provider to raise non-recourse financing from a bank or other financing counterparty. Propostion 16 - A defeated California Initiative. PG&E qualified Proposition 16 for the June 2010 ballot. Titled the “The Taxpayers Right to Vote Act" , the measure requires local governments to obtain the approval of 2/3 of voters before providing electricity to new customers or expanding service to new territories if any public funds or bonds are involved. The measure would make it very difficult for local communities to switch from PG&E and other investor-owned utilities (IOUs) to municipal-owned utilities (MUNIs) To date, PG&E has been the sole contributor to the Yes on Prop. 16 political action committee (PAC)—contributing a total of $19 million to support the measure as of March 9, 2010. RPS - Renewable energy Portfolio Standards - A regulation that requires the increased production of energy from renewable energy sources, such as wind, solar, biomass, and geothermal. The RPS mechanism places an obligation on electricity supply companies to produce a specified fraction of their electricity from renewable energy sources. Certified renewable energy generators earn certificates for every unit of electricity they produce and can sell these along with their electricity to supply companies. Supply companies then pass the certificates to some form of regulatory body to demonstrate their compliance with their regulatory obligations. SPPA - Solar Power Purchase Agreement - Depends heavily on the existence of the solar investment tax credit, which was extended for eight years under the Emergency Economic Stabilization Act of 2008. The SPPA relies on financing partners with a tax appetite who can benefit from the federal tax credit. Typically, the investor and the solar services provider create a special purpose entity that owns the solar equipment. The solar services provider finances, designs, installs, monitors, and maintains the project. As a result, solar installations are easier for customers to afford because they do not have to pay upfront costs for equipment and installation. Instead, customers pay only for the electricity the system generates. Utility Cooperative - A type of cooperative that is tasked with the delivery of a public utility such as electricity, water or telecommunications to its members. Profits are either reinvested for infrastructure or distributed to members in the form of "patronage" or "capital credits", which are essentially dividends paid on a member's investment into the cooperative. Each customer is a member and owner of the business with an equal say as every other member of the cooperative, unlike investor-owned utilities where the amount of say is governed by the number of shares held. Many such cooperatives exist in the rural United States, and were created by the New Deal to bring electric power and telephone service to rural areas, when the nearest investor-owned utility would not provide service, believing there would be insufficient revenue to justify the capital expenditures required. Many electric cooperatives have banded together to form their own wholesale power cooperatives, often called G & Ts, for generation and transmission, to supply their member-owners with electricity. Many utility cooperatives strive to bring the best service at the lowest possible cost, but often the high cost of maintaining the infrastructure needed to cover large, rural areas without the support of large cities as a rich customer base causes prices to be high. However, a few such co-ops have managed to tap into urban markets (due to growth into previously rural territory served by the co-ops) and have proven to be very cost-effective. Former Federal Energy Regulatory Commission member Nora Brownell says CCAs are "the only great exceptions to the failure of electric deregulation in the U.S." With every CCA yet formed still in operation and charging ratepayers less per kilowatt hour than their Investor-Owned-Utilities, CCAs have proven to be reliable and capable of delivering greener power at competitive prices. Ohio’s Office of the Consumer’s Council has said that CCA is “the greatest success story” in Ohio’s competitive market, and new legislation to re-regulate utility rates in Ohio will preserve CCA even if other forms of competition are eliminated. In Massachusetts, the success of the Cape Light Compact has led to the formation of new CCAs used in towns such as Marlborough, Massachusetts. 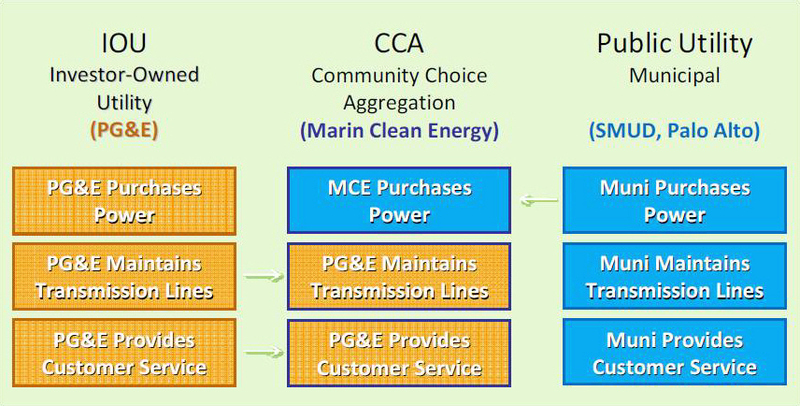 Community Choice Aggregation (CCA) is a system enabled by California Assembly Bill 117 (2002) that allows local governments to procure electric energy for residents and businesses within a community. CCA’s enabling legislation requires that investor-owned utilities such as Pacific Gas & Electric (PG&E) cooperate with local governments and provide electricity delivery over its existing distribution system and provide consumer metering, billing, collection and all traditional retail customer services (i.e., call centers, outage restoration, extension of new service). A local government is not required to manage electric transmission or distribution services or develop infrastructure for CCA. PG&E must provide delivery services to CCA customers under the same terms and conditions as provided to other of its customers. It is important to distinguish CCA from municipal utilities and from investor owned utilities as each of these entities provides different services, has different responsibilities, and operates under different regulatory frameworks. Local governments that implement CCA programs do not become a municipal utility which owns and operates transmission and distribution systems. A critical distinguishing factor is that the City would not own the electric distribution system within the City. Rather, it would own or procure electric power from the wholesale markets through power purchase agreements and distribute electric power through PG&E’s existing infrastructure. Since 1997, CCA Laws have been passed by New Jersey, Ohio, Massachusetts, California, and Rhode Island. The largest CCA to form so far was the Northeast Ohio Public Energy Council (NOPEC), which serves 650,000 customers with gas and electricity, switching them from utility coal and nuclear power to a gas and renewables portfolio with a guaranteed 5% discount below utility prices. Reduce Cost of Renewable Energy - Cut the cost of renewable energy projects like wind farms and solar panels by 50 percent or more. Local Control - Shift political power away from large energy corporations and into the hands of local governments, residents, and small businesses. CCA shifts financial power away from corporate utilities and the California Public Utilities Commission (which many activists characterize as suffering from "regulatory capture" by the companies it is tasked with overseeing) and places the power of the purse in the hands of local officials. With this ability comes the potential for reinvesting in conservation and efficiency programs, creating new local jobs, and lowering consumers' energy bills. Reliability - Take advantage of cutting-edge energy efficiency and demand response technologies to ease the burden on public utilities and improve system reliability and environmental performance. Non-Cooperation from Utilities - On May 3 2010 the California Public Utilities Commission's (CPUC) Executive Director notified PG&E that certain recent actions by the utility in Marin County, Calif., related to CCA have violated tariffs and rules and directed PG&E to immediately cease such actions. 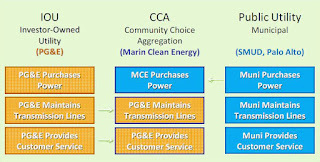 On April 9, 2010, the CPUC confirmed Marin Energy Authority (MEA) as a community choice aggregator in California. The CPUC has heard from members of the public and MEA that although PG&E has a statutory obligation to cooperate with community choice aggregators, instead the utility has been attempting to thwart MEA's efforts to launch the new CCA. After evaluating PG&E's actions, the CPUC's Executive Director sent a letter to the company, outlining actions that PG&E must immediately cease, including telephoning customers to ask them to opt out and then transferring the call that PG&E initiated to a PG&E customer service representative. The CPUC said that customers electing to opt-out of MEA service must do so only by the methods included in the customer notification provided by MEA - by the customer calling a phone number or visiting a website. PG&E cannot obtain an opt-out by using an opt-out form PG&E includes in a newspaper advertisement or by visiting a customer's residence and asking the customer to provide an oral or written opt-out during the visit. In addition, PG&E may no longer send mailers that have the appearance of an official opt-out notice to its customers in Marin County for the purpose of encouraging these customers to opt out of the CCA program established by MEA. These mailers are likely to create unnecessary customer confusion and therefore violate the statutory requirement that PG&E cooperate fully with any community choice aggregators. PG&E was directed to meet with the CPUC's Energy Division to identify the specific customers who have opted out of MEA service in the manners specified above and develop a way of informing these customers that their opt-outs are invalid. CleanPowerSF - San Francisco adopted a CCA Ordinance in 2004, creating a CCA program to build 360 Megawatts (MW) of solar, green distributed generation, wind generation, and energy efficiency and demand response to serve San Francisco ratepayers. Specifically, the ordinance combined the power purchasing authority of CCA with a revenue bond authority also developed by Fenn to expand the power of CCA. In 2007 the City adopted a detailed CCA Plan also written primarily by Fenn (Ordinance 447-07, Ammiano and Mirkarimi), which established a 51% Renewable Portfolio Standard by 2017 for San Francisco. (formerly Sempra Energy Solutions). Once the scoring phase of the RFP concludes, the SFPUC will then enter into contract negotiations with the winning respondent to begin setting-up San Francisco’s clean energy program. Implementation is planned for late 2011. Groundswell - Washington, DC - Groundswell knits together a group of community institutions and assesses their aggregate energy needs. It then collects bids from energy suppliers who can offer competitive rates and often hire from within the local community. The latest purchase, which closed in March 2012, counted 103 groups from across Maryland and the District — more than twice the number that participated in the previous round. The Georgetown Presbyterian Church, Cesar Chavez Public Charter Schools for Public Policy and the NAACP were among the groups that took part. Marin Energy Authority (MEA) - A Joint Powers Authority formed in 2008 comprised of local governments in Marin County: Belvedere, Fairfax, Mill Valley, San Anselmo, San Rafael, Sausalito, Tiburon and the County of Marin. MEA operates the Marin Clean Energy (MCE) program, which is a CCA now serving electric service customers in Marin County. Since the passage of Assembly Bill 117 in 2002, the MEA has formed the only CCA program in California. implementation in May 2010 to include 9,600 customers (mix of residential, municipal and commercial users) and will incrementally expand to provide electricity to all electric service customers in MEA jurisdiction by May of 2012. MEA provides electric service customers with a choice of electric service providers. Electric service customers may choose to buy electricity from PG&E or from MEA. MEA currently offers two options for their electric service customers: Light Green and Deep Green. Light Green has a 27 percent renewable energy content and was designed to mirror PG&E's rates. Electric service customers have the choice to upgrade to the Deep Green option which is 100 percent renewable energy and costs an additional 7 percent or about $5-10 per month. MEA is an “opt-out” program, which means customers are automatically enrolled in the program unless they specifically choose to continue with PG&E. All electric service customers receive four notifications from MEA prior to being automatically opted in to the MEA program. Electric service customers have the choice to purchase power from the MEA or PG&E. Electric service customers may choose to opt out at anytime and switch to PG&E. San Joaquin Valley Power Authority (www.communitychoice.info.) - On April 30, 2007, the CPUC authorized its first Community Choice Aggregation (CCA) application. The application was submitted by the Kings River Conservation District on behalf of San Joaquin Valley Power Authority (SJVPA). made up of Kings County and 8 local cities - Clovis, Dinuba, Hanford, Kerman, Kingsburg, Parlier, Reedley, and Sanger - to engage in regional energy planning and bring energy choice to local residents and businesses in the central San Joaquin Valley. The Authority prepared a Community Choice Implementation Plan and received certification by the California Public Utilities Commission on April 30, 2007. The Authority will set electrical generation rates for customers within its service area and will purchase power from the Kings River Conservation District. Conservative estimates on rates show a 5 percent savings on generation costs. In June 2009: the SJVPA Board temporarily suspended implementation activities. NOPEC - Northern Ohio Public Energy Council has been serving Ohio customers since September 2001. In December 2009, NOPEC entered into an agreement with FirstEnergy Solutions Corp. (FES), a subsidiary of FirstEnergy Corp. (NYSE: FE), making FES the generation supplier for customers in the 126 Northeast Ohio communities served by NOPEC. The agreement extends from January 1, 2011, through December 31, 2019. In addition, FES and Gexa Energy - NOPEC's current generation supplier - have signed a letter of intent that is expected to make FES the supplier for NOPEC communities in 2010. Through its innovative Powering Our Communities program, FES will make a onetime grant of $12 million, which will be administered by NOPEC for energy-related programs throughout its communities. The program will also provide residents and small businesses of those communities with guaranteed long-term electric generation savings that are expected to total an estimated $19 million a year, based on current generation prices. In addition to these savings, NOPEC will use funds it has available to offer its communities additional discounts. NOPEC's board chairman Joe Migliorini said, "We've once again been able to leverage our group buying power to obtain the most advantageous deal for our customers and member communities. Fulton, Illinois, In May 2011 the city of Fulton signed a three year agreement to buy its power from FirstEnergy Solutions. Fulton is the first city to take advantage of Illinois’ municipal aggregation laws and selected its own supplier. Customers may opt out of the aggregation program and shop for a different supplier or accept the standard rate offered by the utility. Residential customers will have a fixed price of 6.23 cents per kWh and small business will pay 6.04 cents per kWh with the agreement. These prices are approximately 20% less than ComEd’s current average generation rate. ComEd will continue to read meters, send monthly billing statements and maintain service for participants in the municipal aggregation program. Administer rate-payer funded surcharge. This charge appears on monthly electric bills as the “Energy Conservation” charge and is one of the funding sources for Cape Light Compact’s Energy Efficiency Programs, which are available to every resident and business on Cape Cod and Martha’s Vineyard regardless of which electric supplier the ratepayer chooses. City of Berkeley - The Final Base Case Feasibility Study for the City of Berkeley was completed in April 2005. The analysis indicated the City is likely to obtain cost savings equal to over $5 million per year or approximately 6% of customers’ electricity bills on average over the study period. The analysis showed that a 50% renewable energy target can be achieved with no rate increases for customers if the City is willing to finance renewable resource development to supply the CCA program. City of Emeryville - The Final Base Case Feasibility Study for the City of Emeryville was completed in March 2005. The analysis indicated the City is likely to obtain cost savings equal to over $3.7 million per year or approximately 10% of customers’ electricity bills on average over the study period. The analysis shows that a 50% renewable energy target can be achieved with no rate increases for customers if the City is willing to finance renewable resource development to supply the CCA program. City of Oakland - The Final Base Case Feasibility Study for the City of Oakland was completed in April 2005. The analysis indicated the City is likely to obtain cost savings equal to over $17.9 million per year or approximately 5% of customers’ electricity bills on average over the study period. The analysis shows that a 50% renewable energy target can be achieved with no rate increases for customers if the City is willing to finance renewable resource development to supply the CCA program. City of Pleasanton - The analysis indicated the City is likely to obtain cost savings equal to approximately $6.6 million per year or approximately 5% of customers’ electricity bills on average over the study period. The analysis shows that a 50% renewable energy target can be achieved with no rate increases for customers if the City is willing to finance renewable resource development to supply the CCA program. The City of Pleasanton is currently evaluating whether to move forward in developing a potential CCA. City of Richmond - The analysis indicated the City is likely to obtain cost savings equal to over $6.6 million per year or approximately 7% of customers’ electricity bills on average over the study period. The analysis shows that a 50% renewable energy target can be achieved with no rate increases for customers if the City is willing to finance renewable resource development to supply the CCA program. Constellation Commodity Energy, Bidder of CleanPowerSF contract and the largest wholesale energy company in North America. Subsidiary of Constellation Energy, Baltimore, MD, a Fortune 200 company with 2006 revenues of $19.3 billion, is the nation's largest competitive supplier of electricity to large commercial and industrial customers and the nation's largest wholesale power seller. Constellation Energy also manages fuels and energy services on behalf of energy intensive industries and utilities. It owns a diversified fleet of 78 generating units located throughout the United States, totaling approximately 8,700 megawatts of generating capacity. The company delivers electricity and natural gas through the Baltimore Gas and Electric Company (BGE), its regulated utility in Central Maryland. Local Power Inc. - San Francisco, CA - An Energy Service Bureau helping cities adopt, implement and manage Community Choice Aggregation (CCA) energy networks. LPI's founders created Community Choice Aggregation (CCA), Solar Bonds and other major tools for green cities. Founded by Paul Fenn, who had served as Senator Montigny's Energy Advisor, formed Local Power (local.org and localpower.com), drafted new CCA legislation for California. In a campaign organized by Local Power, the City and County of San Francisco led Oakland, Berkeley, Marin County, and a group of Los Angeles municipalities in adopting resolutions asking for a state CCA law in response to the failure of California's deregulated electricity market. Fenn's bill was sponsored by then Assembly Member Carole Migden (D-San Francisco) in 2001, and the bill became law (AB117) in September, 2002. Noble America Energy Solutions - San Diego, CA - In Nov 2010, RBS Sempra Commodities (Joint venture between Royal Bank of Scotland and Sempra) completed the sale of its Sempra Energy Solutions business to Noble Americas Gas and Power Corp a subsidiary of Noble Group Hong Kong/Stamford, CT is a market leader in managing the global supply chain of agricultural, industrial and energy products. Our “hands on” approach to business has seen us grow to become a world leader in supply chain management in just 20 years. Their risk-management products are structured to meet the unique needs of each customer. One of four bidders for CleanPowerSF's supplier contract. One Block Off the Grid - San Francisco - just announced a $5 million round A of venture capital from New Enterprise Associates. OBOG is an online start-up which acts as a consumer solar advocate that engineers group discounts for solar purchases. The firm has helped to initiate almost 600 residential solar installations across the U.S. since the company's founding in 2008. Power Choice Inc. - One of four bidders for CleanPowerSF's supplier contract. Formed in 2009 to serve the emerging needs of newly formed Community Choice Aggregation (CCA) and Direct Access programs, in California and elsewhere in the US. Their website is currently a single splash screen. Power Choice brings together an alliance of best-in-class energy services companies with several decades of experience in California and around the world. Currently, consortium members serve and manage an electrical power load greater than that of all California-based investor-owned utilities combined. SENA - Shell Energy North America, Houston, TX - Supplier to MCE and bidder to CleanPowerSF. California Energy Commission - PIER Program Area: Renewable Energy Technologies- Community Choice Aggregation Pilot Project - In this pilot project, 12 California local governments evaluated the feasibility of implementing community choice aggregation programs through which a minimum renewable energy mix of 40 percent would be achieved, at least doubling the Renewables Portfolio Standard. Three groups of cities/counties went on to develop business plans through this program detailing how community choice aggregation programs for their regions would be organized, governed, funded, and operated to provide at least 50 percent renewable energy to participating customers.